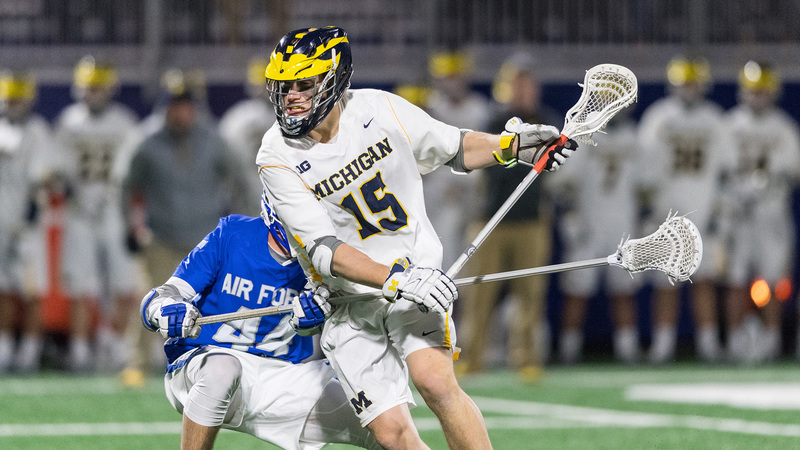 Boston, MA - (February 13, 2019) - Major League Lacrosse (MLL) takes a look into draft prospect and Michigan midfielder, Brent Noseworthy. The University of Michigan often simply referred to as Michigan, is a public research university in Ann Arbor, Michigan. The Michigan Wolverines men's lacrosse is relatively new, as it was founded in 2012. Prior to joining the NCAA, Michigan competed as a club-varsity program at the Division I level of the Men's Collegiate Lacrosse Association (MCLA) in the Central Collegiate Lacrosse Association (CCLA). As a club sport, the men's lacrosse team secured 3 MCLA national championships and won 11 consecutive conference titles. They have not yet made an appearance in the NCAA tournament. Their current coach is Kevin Conry. Preseason active rosters in Major League Lacrosse feature Michigan players such as Kyle Jackson (Boston Cannons), Mikie Schlosser (Denver Outlaws) and Mike Hernandez (Denver Outlaws). Noseworthy is likely to join the ranks of the current MLL Michigan standouts. "Brent has evolved his game to be a more complete player," Said Coach Conry. "He is known for his finishing ability and range, but is also an excellent dodger and feeder. We ask Brent to do more than just play offense. He faces off and plays defense in critical times as well. He is a student of the game and will have no problem adjusting to the pace of the MLL." Noseworthy is originally from Burlington, Ontario. He attended Corpus Christi Catholic Secondary School and Avon Old Farms School before attending Michigan. In his time at Michigan, he has set the U-M single-season goal record with 41 goals and points (48), led the Big Ten and ranked No. 4 nationally in goals per game (2.93), ranked No. 3 in the Big Ten in points per game (3.43/game), in 2018 had eight hat-tricks - 10 multiple point games and 10 multiple-goal games, and he was the only player in NCAA to score at least 40 goals and take at least 15 faceoffs. These accomplishments earned him: Team MVP, Team Offensive MVP, Inside Lacrosse All-American, USILA All-American, First Team All-Big Ten, and Tewaaraton Award Watch List. This year Noseworthy is a team captain and a Preseason All-American. In the first game of Michigan's season last week, Noseworthy scored 2 goals against Cleveland State, in their 10-8 win. Will Noseworthy's versatility be enough for MLL general managers and coaches to pick him up in the 2019 MLL Draft presented by Cascade? Tune into Lax Sports Network on March 9 at 7pm to see if Brent Noseworthy will be one of the 63 players to be selected in the 2019 MLL Draft presented by Cascade.